This pizza is not your average pizza. It has a bit of a sweeter taste to it, but still has the salty, cheesy flavors of normal pizza. 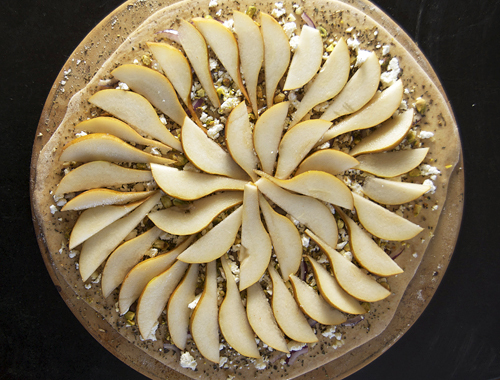 I LOVE this combination- pears, goat cheese and pistachios. Goat cheese is a great pair for fruit, pistachios are a great pair for goat cheese, so naturally they are also a great pair for fruit. If you like exciting new flavors and combinations, I highly recommend you try this pizza. Roll out pizza dough into a circle and spread olive oil over the surface. Season the dough with the oregano, garlic powder, salt and pepper. 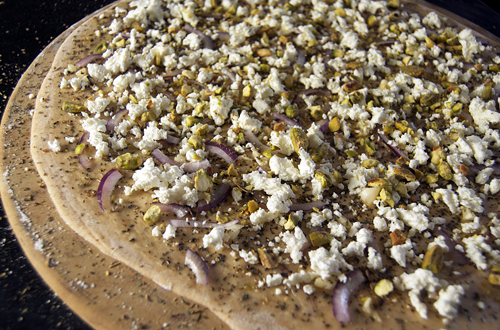 Layer the red onion, pistachios and goat cheese evenly across the surface. 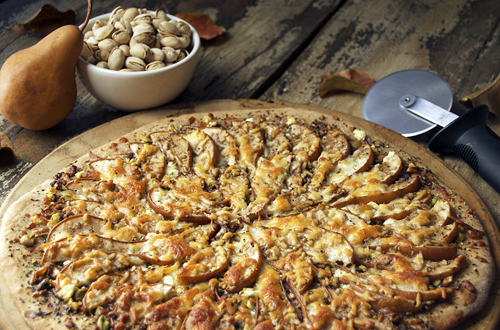 Next, layer the pear slices in a clockwise motion until pizza is covered. It looks absolutely delicious and light and healthy as well! Wow, now that truly sounds different and amazing. I love trying things completely different. I have a confession. I’m not a big pizza fan. But this pizza looks so amazing, it just might change my mind! Thanks for posting! OH MY GOSH! This looks SO fantastic- what a unique pizza idea! I would definitely order this in a restaurant! This looks like a great pizza!!! Thanks for sharing! Wow that crust looks fabulous, wish there was a recipe for that! I love the different topping combination on this one. We eat so much pizza that I am constantly looking for new ideas. Eating the same old pepperoni can get boring. Although my go to pizza has got to be sausage and jalapenos. That sounds amazing! 🙂 Love pear and goat cheese, so why not on a pizza? Great photos! And I can attest to the deliciousness of this pizza since I was the lucky person to find the leftovers and eat them! Love the flavors here in the pizza and it looks gorgeous!!! Your pictures are absolutely stunning- I almost found myself licking the screen! wow! 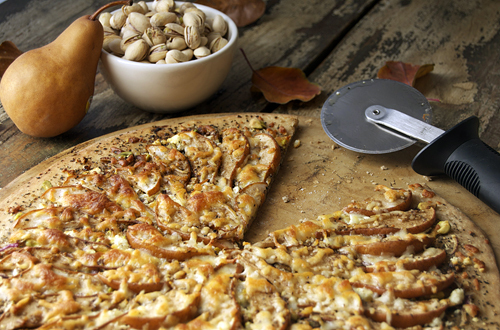 this is so similiar to my favourite California Pizza, thankyou for a make a home version!